Planning for a visit to a foreign country is sketchy at best. 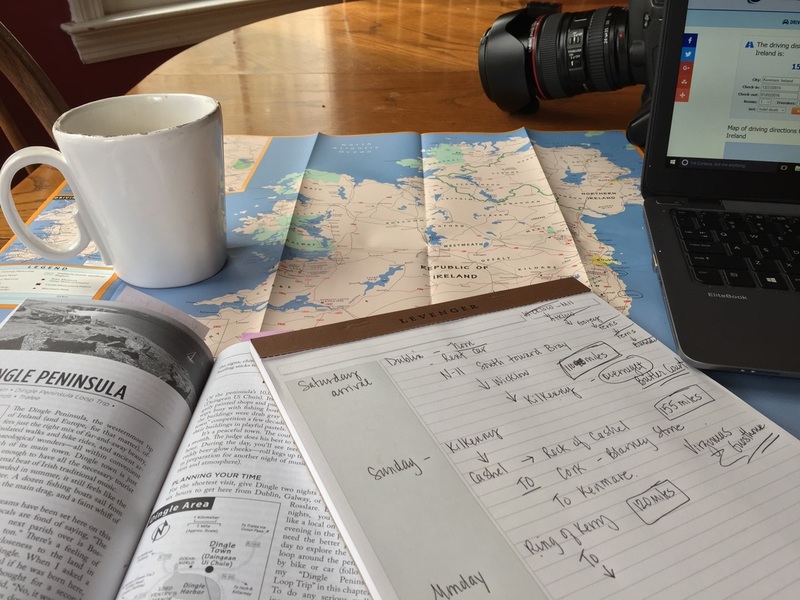 Even if you love traveling as much as we do, the planning becomes laborious and many times, it makes the hair stand up on the back of your neck. Another reason why me (that would be Judy) does most of the planning and organizing and reserving and worrying and spending. I do it before I even leave home, so that I can IF the moment presents itself when spontaneity is the only path to follow, then by all means, #wego! Follow Rick Steves guidebook (regardless of where you find yourself). We've followed it verbatim, down to the flow of the trip, walking tours, areas to avoid, recommendations for B & B (with first names of owners) and restaurants, and if something is missing, contact him on Facebook. He (or one of his travelers) WILL respond to your plight. Car rental. Google it. It will be cheap. But wait. It's not so black and white. You will find every major car rental agency in Ireland at Dublin airport, and most reservations can be booked online before you leave home. However, with some carriers, you can only book the car rental plus add-ons (navigation, WiFi, car seats, extra driver) and the standard insurance. Once you arrive to pick up your vehicle, they will ask to put a charge on your CC as a security deposit against damage; it's called Super CDW. The security deposit: a whopping $1400-$2000 (what we were quoted). According to Rick Steves, the deposit is based on the class of vehicle and they saw estimates of up to 5000 euros. Instead of this, add a SUPER insurance policy to your rental; ours was $19 a day. If you think your credit card will cover insurance (it does most places), check the fine print and you'll find that these countries are excluded: Ireland, Northern Ireland and Israel. We rented with Dooley Car Rentals. Polite, courteous and very patient. Jim explained the insurance issue and we gladly took care of it when we reserved. They also have a US contact number and office. Delightful people. We have never met Roie, the innkeeper at Clare Island Lighthouse that sits off Ireland's western Atlantic coast. when we inquired about spending the night in the lighthouse, our hearts broke to learn that during January's brutal weather, the ferry doesn't run; therefore, the lighthouse is closed. She took our pain to heart, so she's meeting us for tea in Westport and telling us about her lighthouse, her country and her life. We just have to return when that ferry is working! Traveling to Ireland in January is relatively inexpensive. However, when you tell someone you're traveling to Ireland in January, they look at you like you've lost your mind. Come to find out, visiting Ireland in winter is like hen's teeth, meaning rare. Phrases you must know: "Sure look at it." [an acceptable response to any question, comment or statement]; "the jacks" [the toilet]; "wet the tea" [you're getting tea in a pot with boiling water]; "the boot" [hey, I know this one - the trunk of the car]; "I will yea" [Irish sarcasm, and no, you won't]; "a whale of a time" [a great time, what we're going to have]. We invite you to follow us in real time (ON FACEBOOK AND HERE) beginning January 29. We'll take you along on this adventure of a lifetime - to see the beautiful country of ireland and to meet our grandchildren.